When I would aid my father in various building projects around the home, he would often carry with him a straight edge "T" square. 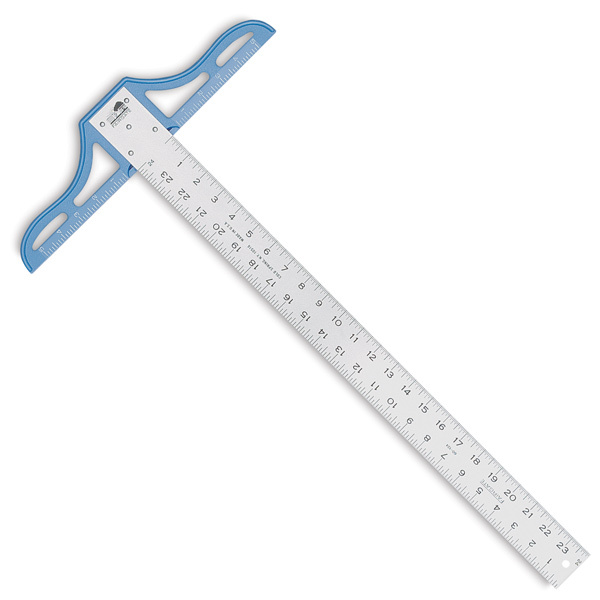 The device looked like a ruler connected to a cross piece running perpendicular to the ruler. Whenever my father needed to cut boards, he would grab his "T" square and mark off a perfectly straight line. I recall in one project, all of the boards that he had ordered were slightly crooked. In order to make them usable, my dad had to take the "T" square and draw a straight-line down the entire length of each board and then saw-off the material that didn't belong. My dad did all of this to make the boards "justified" or "right" with the purposes of his project and with the standard of his "T" square. The bad-news: We are all born crooked or "unjustified"
Every person born into this world, including you and me, arrived just like the boards above in the illustration - crooked and unusable. Romans 3:10-11 states - "as it is written, “There is none righteous, not even one; 11 There is none who understands, There is none who seeks for God". To extend the comparison, we are not only crooked, but rotton to the core, full of knots and ridden with bugs. Romans 3:12 reminds us: "All have turned aside, together they have become useless; There is none who does good, There is not even one.” In Philippians 2:15 Paul writes regarding unbelieving humanity - "so that you will prove yourselves to be blameless and innocent, children of God above reproach in the midst of a crooked and perverse generation, among whom you appear as lights in the world." The boards of human nature need to be justified or made right in God's sight for people to be deemed acceptable in His sight. The principle set forth by Solomon in Ecclesisates 1:14-15 is pretty bleak - "I have seen all the works which have been done under the sun, and behold, all is vanity and striving after wind. 15 What iscrooked cannot be straightened and what is lacking cannot be counted." At issue is the fact that man by himself cannot make himself morally and spiritually right before God. Mankind has been affected by the fall of sin through and through. The question is raised in Job 25:4 “How then can a man be just with God? Or how can he be clean who is born of woman?" When it comes to God's standards of what is right and wrong, such standards are located within His own being. In effect, God is His own "T" square. When Jesus the Son came to this world, He being very God in terms of His Divine essence took upon himself a very true and real sinless humanity. As God-incarnate, Jesus Christ walked as the Living standard of what constituted "rightness" (see 1 Corinthians 1:30). Romans 3:23-24 states - "even the righteousness of God through faith in Jesus Christ for all those who believe; for there is no distinction; 23 for all have sinned and fall short of the glory of God, 24 being justified as a gift by His grace through the redemption which is in Christ Jesus." When Paul writes in Galatians 2 about the battle he was waging over how a person is made right with God, his message was emphatic: justification (being made right with God) has one basis: Jesus Christ's life and finished work. Additionally, justification has one means of reception: faith alone. Galatians 2:16 "nevertheless knowing that a man is not justified by the works of the Law but through faith in Christ Jesus, even we have believed in Christ Jesus, so that we may be justified by faith in Christ and not by the works of the Law; since by the works of the Law no flesh will be justified." Romans 3:22-24 states in even more vivid detail - "even the righteousness of God through faith in Jesus Christ for all those who believe; for there is no distinction; 23 for all have sinned and fall short of the glory of God, 24 being justified as a gift by His grace through the redemption which is in Christ Jesus." Hence the Divine-human "T" square of living righteousness, Jesus Christ, is the only way in which our other-wise crooked and unacceptable humanity can be made acceptable. By faith alone can the Divinely-drawn straight line of Christ's life and finished work be received, credited and applied.